NEW FA of Malaysia (FAM) president, Tunku Ismail Ibrahim, the Tengku Mahkota of Johor (TMJ), wasted no time making decisions that might have ruffled feathers, especially of those vanquished in the elections. Tunku Ismail’s decisions — the replacement of national team coach Datuk Ong Kim Swee by former Johor Darul Ta’zim (JDT) coach Mario Gomez; Kim Swee’s demotion to the Under-22 squad; and the removal of Frank Bernhardt — made before any council or team management meeting, caused a shock to some quarters. But a majority, especially those who were elected to a new term of office, had no qualms because it was what they had bargained for. When he was approached to head FAM by several affiliates, Tunku Ismail had said he would manage the body as he deemed fit. In fairness to Tunku Ismail, he had met the new council briefly after the elections before he announced a slew of decisions to the media. Eighty per cent of the delegates at last Saturday’s election comprised of young and new faces who had given the mandate for sweeping change, underscored the reality that change was what they wanted. As one senior official observed: “For far too long FAM have been managed by consensus and sometimes good proposals have been thrown out by previous presidents because state FAs opposed for reasons best known to them. “This has affected the development of football and brought us to our current situation. “It’s about time we tried something new and with Tunku Ismail being young and having proven himself with his stewardship of JDT, we need to give him full support. It’s important Tunku Ismail gets full backing and not back-biting from the state FAs. Anyway, Tunku Ismail is a man who won’t tolerate nonsense. The non-compliant will probably have no place in his leadership team. But still the state FAs play a big role in determining whether changes in football’s governance will succeed or fail. States FAs will be expecting the new regime to put many things right for them, especially in terms of funding from broadcasting rights. If they get the allocations they are seeking, they will have to spend wisely. Tunku Ismail is passionate about development and wants the National Football Development Programme (NFDP) to come directly under the jurisdiction of FAM which includes funding (presently under the Sports Ministry) and rightly so. He believes grassroots development, which is non-existent among a majority of state FAs and clubs, must be priority. Indeed, exciting times are on course for Malaysian football, but state FAs must not buck the national interest. Tunku Ismail has to change the mentality that allows state interest to take precedence over national interest. Tunku Ismail must be careful not to be over reliant on foreign expertise. Even if he does, he must make sure the foreigners are the best and have locals as understudies. The Exco must be prepared for an earful when they meet for the first time under TMJ in Kota Kinabalu next week. Tunku Ismail is expected to outline his style of management. More sweeping changes are expected. However, judging from the positive feedback, there seems to be hope for change. However, only time will tell. Quality long term programmes, patience, hard work, dedication and concerted effort are the pre-conditions for light at the end of a long dark tunnel. NEWLY elected FA of Malaysia president, Tunku Ismail Sultan Ibrahim, the Tengku Mahkota of Johor (TMJ, wasted no time in taking immediate decisions which might have ruffled some feathers in the football family, especially among the anguished in the elections. TMJ’s decisions among them included the removal of national coach Ong Kim Swee to be replaced by Mario Gomez, Ong given the task to handle the national Under-23 team and the removal of Frank Bernhardt, before any Council or team management meeting, saw some shocked faces. But a majority, especially those who were elected in for the new term of office, had no qualms because it was what they had bargained for. TMJ when he was approached to head the national body by many affiliates, in his meetings with the representatives of the State FAs had clearly outlined that if he was to head FAM, he has to be given the mandate to manage the body he deems fit and all of them have to support him. He has made it crystal clear that they will have to follow his momentum and pace as he likes to do things fast and get it done. He had also said that he has his style of working and the Exco will have to follow him and his style. In fairness to TMJ, he had meet the new Exco briefly after the elections before he met the Media to take centre stage with his announcements of immediate action. He has asked them to support whatever decisions he has to announce. FA of Malaysia’s ways of common consensus through Council decisions and the various committees may have seen its last days. The fact that 80 percent of the delegates from the states for last Saturday’s election comprised of young and new faces and had given the mandate for a sweeping change in the new Exco line-up, underlines that they wanted changes. And they knew fully well what they were bargaining for with TMJ helming the national body. One senior football official said: “For far too long FAM have been managed by common consensus and sometimes good proposals have been thrown out under their previous presidents because State FAs opposed for reasons best known to them. “This has affected the development of football and brought us to our current status. “It is about time we tried something new and with TMJ being young and proven himself with his club JDT, it is about time we tried something his way and need to give him full support. 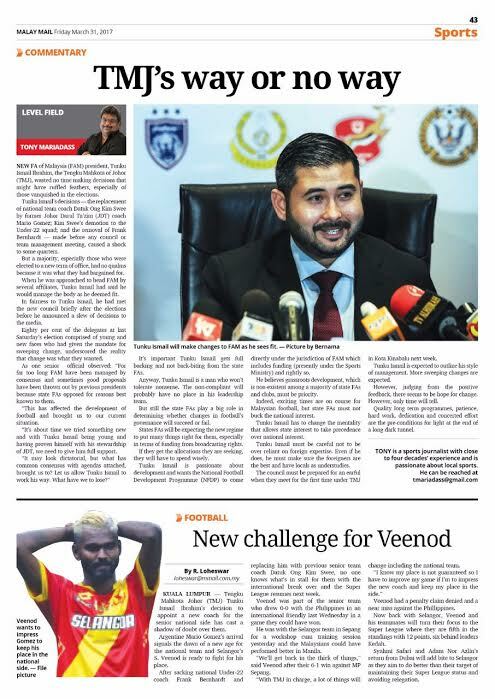 However, it is important that TMJ gets full backing and not back-biting from the State FAs. Anyway, TMJ is a man who tolerates no nonsense and non-compliants will probably have no place in his team. But still the State FAs play a big role in success or failure. It is important that all in State FAs Council are in the same page of TMJ’s vision and style. States FAs will be expecting to the new regime to put many things right for them, especially in terms of funding coming from broadcasting rights. But the State FAs if they get their windfalls need to spend wisely and channel it to the right areas to ensure a bright future for Malaysian football. TMJ is passionate about football development and wants the National Football Development Programme (NFDP) to come directly under the jurisdiction of FAM which includes all funding (presently under the Ministry of Sports) and rightly so. He believes that grassroots development which is non-existence among a majority of State FAs and clubs, should buck up and take the matter seriously and make it their priority agenda. However, a word of caution though – in the past FAM had tried to ensure all State FAs give importance to development and specified substantial funding from the grant through previous sponsors (Dunhill), was to go towards development, but it never happened. The allocation went to other areas, especially the management of the M-League teams and acquisition of foreign players and coaches. When questioned by FAM, they turn around and say it is up to them to spend the money how they deem fit! Maybe this time around, State FAs should only be given their development allocation after putting the programme in place and payment to come direct from FAM. This way, it will ensure that the development programmes are in place, up and running and monitored. Indeed, exciting times are expected for Malaysian football under the new regime, but the State FAs are a notorious lot with their own agenda and national interest is their lowest priority. TMJ has to change this mentality and maybe his way of doing things is the only way to shake up Malaysian football. But TMJ must be careful not to rely totally on foreigners and even if he does, he gets to get the best and at the same time given emphasis to have locals as understudies. The Exco must be prepared for an earful when they meet for the first time under TMJ in Kota Kinabalu next Saturday. This already is a change from the norm of FAM’s administration, as TMJ wants to have meetings in the States rather than at the headquarters all the time. TMJ is expected to outline his style of management and more sweeping changes are expected. Some may be difficult to absorb or swallow, but it is going to be TMJ’s way and the sooner they get used to it, the better it will be for a smooth transition. If resistance persists from some quarters, TMJ might even take the road to throw in the towel, for if changes for the betterment of Malaysian football cannot gain support, then he is merely wasting his time, effort and energy. However, judging from the positive feedback and support, there seems to be hope for change. But whether it for real or just being in number for the sake of it, time will tell. It must be underlined that the face of Malaysian football cannot be changed overnight. Damaged has been done over two decades and any resurrection will take time. The national team cannot become a champion team overnight either because we still have the same crop of players. We may improve slightly under a new management with new ideas, but we cannot turn old horses to championship breed, while our young breed have still a long way to become classy players. Quality long term programmes, patience, hard work, dedication and a concerted effort by all will be hallmark to seeing the light at the end of a long tunnel.